Moss is very harmful for all kinds of roofs. 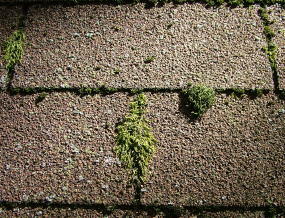 The formation of moss blocks all the gutters and valleys on the roof. Moss is basically formed in areas which are wet for most of the year. Moss is also present in the areas which have humid climate for most of the time. May it be a tiled roof or a shingled roof, the formation of moss is very harmful for all kinds of roofs. This is the reason why it is so important to remove moss from your roof. May it be a residential roof or the roof of any commercial property, the removal of moss is a must from all kinds of roofs. Moss removal from roof tiles can be done with the help of various simple methods. If the moss is very low in number, you can remove the moss growth by yourself manually. If the moss growth is largely present on the roof, then power washing can be considered to remove the moss. A well maintained roof is free from moss. There are various methods to clean moss off roof. We will be talking about some of the methods of moss removal here. Moss is basically a plant which contains root. As the moss grows thicker it starts to creep beneath the shingles or the tiles of the roof. This will cause seepage and leakage as this moss will make room of the water accumulated on the roof to seep through the space created by the moss on the roof. Moss can also cause damage to the shingles and the tiles by breaking them. Following are some steps on how to remove moss from roof shingles. First of all the, you can consider the option of brushing the whole moss over the roof with the help of a broom or a big brush. This will help you take off the moss and also will let you find out if there are some moss plants that have made their way beneath the roof. You can take help of some of the roof moss removal products like Moss out Liquid Concentrate. This product has the ability to kill moss very quickly on all surfaces. Not only house roofs, but just all surfaces where there has been an outgrowth of the moss. You can also try a more homely and easy approach. You can spray hot water with salt in it on the roof. This way the moss will get killed and then you can remove it easily with a brush. Killing the moss on the roof and then removing it is the more easy part. Following steps are the steps that can help you kill the moss. You can use a zinc Strip and place it on top of the roof, this will kill the moss and then you can remove the moss. You can use zinc chloride. You can also use roof moss removal products like commercial weed killer. This product will help you kill all the moss on the roof. Once the moss is dead, you can remove it very easily. You can also use some preservatives to work for you in this situation if you do not have access to any other material mentioned above. The cost of moss removal totally depends upon the method you choose for moss removal. The easier method you choose the more economical it gets. We have discussed about the possible ways to clean moss of the roof. Also we have discussed methods to kill the moss first and then remove it. It is easy to maintain a roof if moss removal practices are done on time and also under the guidance of a professional.